Adding shares of Enterprise Products Partners, CVS Health, and Brookfield Infrastructure Partners will go a long way in giving your retirement portfolio a boost. 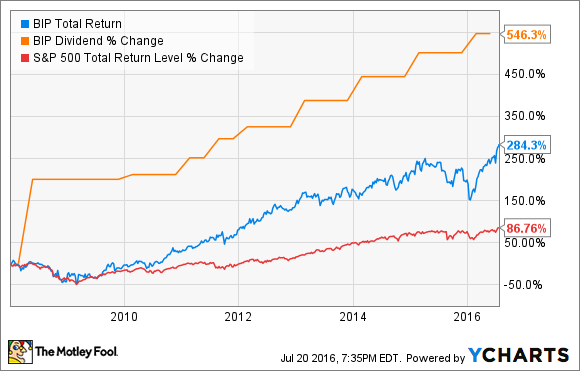 Yes, owning stocks in your retirement portfolio is a good idea. While some will say that you should get away from stocks as you approach or are in retirement, there is always room for stable, reliable dividend paying stocks that will help supplement your income. The key is to invest in companies that have strong competitive advantages and a a track record of paying ever increasing dividends. With this in mind, we asked three of our contributors to each highlight one stock they think would be a great choice for one's retirement portfolio. Here's what they had to say. Tyler Crowe: An investment that is going to provide you with a steady cash stream from dividends is a great way to get the most out of your retirement nest egg. One company that has proven over the years to provide the kind of stable cash flow growth needed to support a dividend over the long term is Enterprise Products Partners (NYSE:EPD). As one of the nation's largest pipeline and energy infrastructure networks, the company generates more than 80% of its revenue from fixed fee contracts that are a lot like a toll booth business model. What is even more impressive about Enterprise is the way in which the company's management has focused on long term sustainable growth and maintaining a rather conservative balance sheet. While so many other pipeline companies got caught up in America's shale boom and built infrastructure that generated lower returns, Enterprise's management team maintained discipline with its investment strategy such that it was investing in a smaller amount of projects that generated higher returns and added value to its existing overall system. It also did so without bringing on debt to fuel growth. Rather, it stayed in its lane, put internally generated cash back into the business, and kept a modest rate of 5% dividend raises. These are nothing new for the company. It's the same thing it has been doing for years and it has been a large reason why the company has been able to increase its dividend every year since its IPO in 1998. With shares giving you a dividend of 5.4%, shares of Enterprise are a great investment for retirees today. Brian Feroldi: Over the next decade millions of baby-boomers will be reaching retirement age, which is destined to increase the demand for high-quality and affordable healthcare. That fact should be a tailwind for the entire healthcare sector, but I think one of the best ways for retirees to play the trend is to buy shares of CVS Health (NYSE:CVS). You're likely already familiar with CVS Health's retail pharmacy stores. After all, the company holds the #1 market share position in the US, and it's constantly looking for ways to extend its leadership position. One smart way that the company is doing just that is by rolling out a network of in-store clinics -- called MinuteClinics -- across the country. These MinuteClinics offer patients convenient and low-cost access to basic medical care services, which go a long way toward keeping customers loyal. Another reason that I like CVS Health's stock so much is because it's more than just a retail store. The company also owns one of the largest pharmacy-benefits management businesses in the country. This business segment helps any entity that offers a health-benefits program -- think employers, governments, or unions -- to keep their prescription costs in check. The company is able to do so because it buys in bulk and substitutes generics whenever possible, passing along the savings to its customers. With a customer retention rate of 97%, it's clear as day that this is a service that is highly valued. In total, CVS Health holds a commanding position in two vital segments of the healthcare industry, so I'm convinced that it's built to last and will be able to grow for years to come. Add in the fact that it offers investors a fast growing dividend that is currently yielding 1.6%, and CVS Health is a stock that both income and growth investors can learn to love. Jason Hall: My colleagues have offered up two companies that are excellent fits for a retiree's portfolio. They have very strong competitive positions, long-term trends that will keep them relevant for decades, and largely recession-proof businesses. Brookfield Infrastructure Partners L.P. (NYSE:BIP) has those exact same characteristics, while giving investors a way to diversify into various infrastructure assets across the transportation, utility, energy distribution, and raw materials industries. Better yet, it's a boring, easy to ignore business. Brookfield Infrastructure's operations are the kinds of things we rely on everyday -- power transmission lines; ports; toll highways -- to move goods and people around, and power our homes, but never think about. They are often regulated, but also have very high costs of entry, meaning very limited competition. They're also typically -- like CVS Health and Enterprise Products Partners -- largely recession-resistant. As you can see, investors in Brookfield Infrastructure have done 200% better than the S&P 500 since going public, and dividend increases are a big part of why. With a market cap of less than $8 billion, and global private infrastructure valued in the trillions, there's plenty of room for Brookfield Infrastructure to continue rewarding investors for years to come. A wonderful stock for retirees to buy and hold for the long-term.